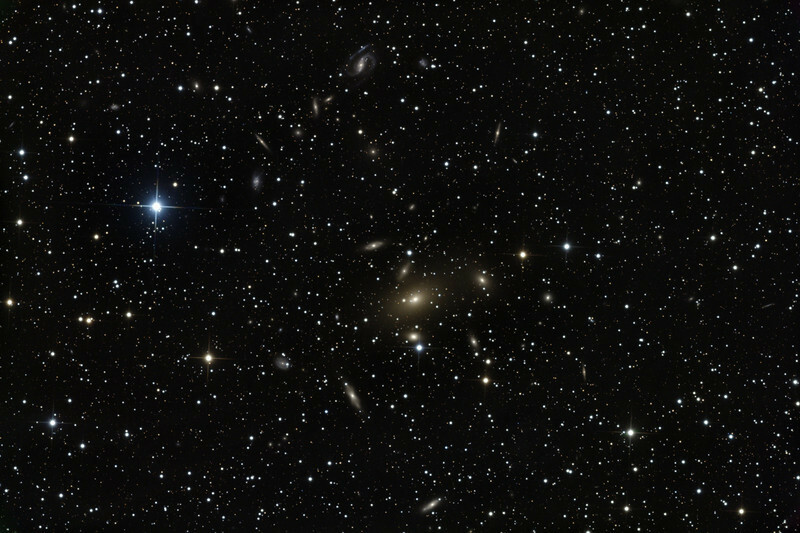 Galxy cluster Abell South 805 in Pavo, centred on the big orange elliptical IC4765. The big blue star is 8 mag SAO254375. A very casual glance sees at least 66 galaxies in this image, most showing form (as the chief inspector would have said). Note the beautiful faint face-on barred spiral at 12 o'clock showing intense blue star formation in the top arm, the edge-on barred spiral with the boxy, almost x-shaped bar seen in profile, and the dozens of thin edge-on spirals in the background. Clear: 7x1 hr subs. RGB 30mins each. STL11000M on PlaneWave 20" CDK on MI-750 fork.